Google account activity report is a handy feature to know usage details of various Google services. You can easily enable account activity report feature and get periodic reports by email for statistics like number of emails sent or received, web searches done and so on. Specific set of users may not be interested in such details as this means wasting more time to read one more email message. You can easily disable Google account activity report feature and stop Google from sending email messages for the same. 1. Open Google account activity webpage located at google.com/settings/activity/ URL. Here you can browse and view all account activity reports. Click on circular icon at top right and then click Settings button. Alternatively, you can directly open google.com/settings/activity/manage/ for settings box. 2. 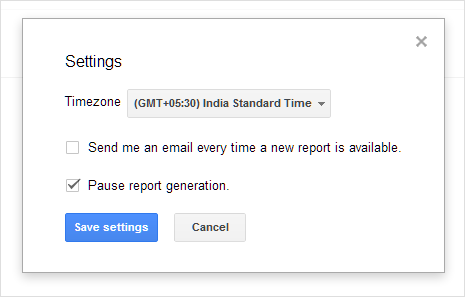 Once you have setting pop-up box on the screen, click to uncheck (no tick) on “Send me an email every time a new report is available” option. This will stop activity email messages from landing in your Gmail inbox. 3. If you are not interested in account activity reports at all, you can also stop their generation. Just click to check (with tick) “Pause report generation”. Click Save Settings button to activate new settings that deactivate the Google account activity report feature. 1. Repeat step 1 above to open dashboard for checking Google account activity reports. You can browse various already generated account activity reports using left and right arrow buttons. 2. Select specific activity report and click on Delete button next to it. Then click Delete button on the confirmation pop-up box. Similarly, you can select other generated account activity reports and delete them individually.